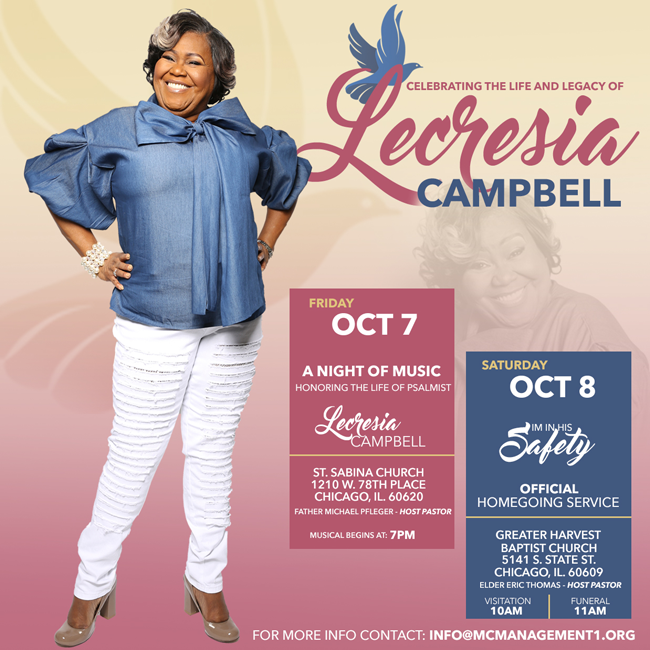 JGM learned today that powerhouse gospel vocalist Lecresia Campbell passed away on September 29. 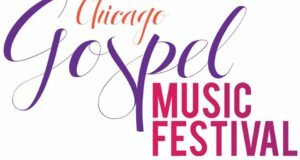 Born in Chicago, Campbell was the lead singer on Walt Whitman & the Soul Children of Chicago’s 1990 gospel smash, “Perfect Praise (How Excellent).” She earned a bachelor’s degree in Applied Voice at Tougaloo College and went on to teach elementary school for eight years. She also was background vocalist for Vanessa Bell Armstrong and sang alongside many others in the gospel industry. In 2008, Campbell recorded a solo album, Even Me, which earned her a Stellar Award nomination for Best Female Vocalist – Traditional. 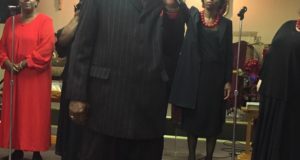 Most recently, she could be heard on The Shalom Church City of Peace Mass Choir’s album, Simply Amazing, singing “When I See the Blood;” and leading “Draw Me Nearer” on the Mississippi Mass Choir’s 2014 release, Declaration of Dependence. No one who has heard Campbell sing will forget the skyrocketing high notes that she would pepper into her presentations. Let us remember Psalmist Campbell with this 2007 video of her singing “Perfect Praise” with the Soul Children of Chicago. How can I get your articles sent to me on a regular basis? Hi, I think that if you subscribe to the RSS Feed (on the right hand side, near the top), you can get the articles sent right to you. Lifting the Campbell family up in prayer! She is resting in the Safety of the masters arms. Although, we will miss her on this side, we will continue the legacy of pure worship. Lecresia Campbell was a powerhouse of her time. She will be singing with God and Jesus Christ and the Angels of God up in heaven. She’s sweet as what I see in her countenance and nature. God truly blessed her when she was alive! I pray and hope she tests in pure peace with God and Jesus Christ! I pray and hope Lecresia Campbell rests in perfect peace up in heaven. God bless her soul as she ascends to the heavens to be with God and Jesus Christ and the Angels of God and I know she will be singing up there to make her sunshine be known up there through her ministry down here that she have and birthed out! Wow, she worked while it was day. Thank you Lord for the gift of this great woman to the body. She always had the voice of an Angel, now she us singing with them!! Omg… I didn’t know she was gone from us. I looked up her video and just stumbled on some articles in trying to find out what she’s doing these days. I grabbed my chest from shock to know that she passed way back in September! Lord, have mercy. I will miss her. “In His Safety” took me through the most terrible time in my life and is one of the songs I want sung or played at my funeral. It was indeed a shock, felt all the more during the recent Soul Children of Chicago reunion. A wonderful singer, now in Heaven. So sadden to hear of her passing , such a beautiful gifted person . I grew on with her in the choir at Mt. Calvary Church on the south side of Chicago . I just listened to her vocals once again. I love her spirit. My Mom passed away and her voice calmed me.